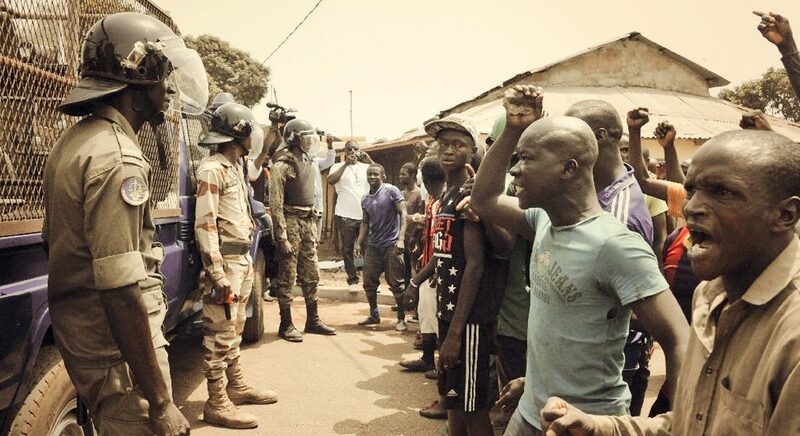 “THE MILITARY STOPPING PEOPLE IN CONAKRY”. I COULD BARELY SEE IT. But, according to Samory, the tall, skinny building rising up behind us had been the Presidential Palace. I turned around and for a fleeting moment I managed to see a huge golden plaque, a whisper of gold and a majestic flag of Guinea Conakry. After turning around, we had already entered the Boulbinet neighbourhood, where on one side we were presented with the Palais des Nations which had the unavoidable appearance of a football stadium, thanks to its circular form, and it being daubed in sunflower yellow which served as testament to the recuperation of the attack it suffered in 1996 when it still housed the presidential office. Samory later parked opposite the Hotel Novotel, which radiated grey and curled like a vertical wave. We left the elegant reception and the pool behind and walked towards a garden, where you could hear the low tide, revealing rocks, and earth that looked like a volcanic setting, reminiscent of petroleum yet definitely sidereal. An imaginary destruction had spat out this fresco, which was complete with a lighthouse in the background, and a phantom port to the right, accompanied by some sinister looking container ships. A Chinese guy carrying a mighty camera meandered in the gardens, documenting the landscape and the children. After each click, the photographer moved the camera away from his face and branded a smile. Not far from him, another Chinese guy had his left ear hooked to his mobile phone and paced, leaving apprehension in the air. I managed to steal a photo of this businessman who responded with a murderous look. From the gardens of the Novotel there was a clear view of the fish market and the port area. Samory made a gesture and we got back in the Peugeot to go through several streets obstructed by mountains of accumulated rubbish combined with a bustle of activity. On reaching the market, Samory raised the tone of his voice as soon as we left the car and scared off a group of bare-chested guys who had said something to me. “We only want to speak with the boss”, they asserted, glancing at me sideways. Samory spoke to them in forceful Malinké and the lads dispersed, opening up the view to dozens of small boats or pirogues invaded with coloured flags and loud, gaudy colours. A number of fishermen were sewing the fishing nets right there, with the help of a wooden thimble and their hands. The smell was a mix of ocean intoxicated with fried and salted fish and muddled with methane which found its ally at the dock of the port where two pigs gulped down all of the rubbish they could among the black, mournful soil. In the midst of this, Samory told me that he had to do something before leaving Boulbinet Port, and straight away he went into a room with other worshippers and began to pray. The trip was coming to its end, and I insisted in taking a walk down the Avenue de la Republique, an area of Kaloum and which was home to the banks, cyber cafes and businesses. The map confirmed that the area covered Boulevard 1, Boulevard 2, Boulevard 3… all of which I did not doubt had been born from the same womb, on the same day and that the haphazard similarities made it almost impossible to tell them apart. The same was true of so many other streets in Conakry. Under Frenchified headings and signs, the streets concealed a chaos that only the Africans, the Guineans, could logically decipher. The sketch that I had scribbled in the morning whispered that I still had to visit the neighbourhood of Ratoma which soaked up the areas of Taouyah, Kipé and Kaporo. The red wine Peugeot headed towards its destination via the Route de Donka, while dozens of women on the backs of noisy motorbikes charged towards us one after the other. It caught my attention, the amount of female motorbike drivers who infiltrated Conakry, when it was much more the norm to see a man in charge of the handlebars. We got to Ratoma, and in the midst of the throng, I felt at home on seeing the amount of empty sofas, which reclined in corners waiting for a buyer with money to sit upon them. The Albert Camus Lyceum also rested here, dusty and lit up in a salmon colour, in amongst other buildings built by the Chinese. The night had crept up on us and I asked Samory to take me back to Minière. It took us a lot longer than we had expected due to the fact that we were stopped at every step by military checkpoints led by beefy Green Beret soldiers accompanied by senior officials. Garbed in green uniforms, with modern machine guns and lanterns, the soldiers inspected every inch of the vehicles and later looked at the driver for a few seconds. To continue on with their journey, some offered a backhander, others uttered the magic words ‘diplomatique’ as was our case. Samory told me that the current president, Alpha Condé who had fought for many years against the dictatorship of Lansana Conté, had promised in vain the abolition of military checkpoints. “The military have a lot of power. If the president won’t let them hunt and pilfer at night, he’ll get in more trouble. TRIP TO BUCHANAN (3) of (6) WOULD YOU KNOW MY NAME, IF YOU SAW ME IN HEAVEN?